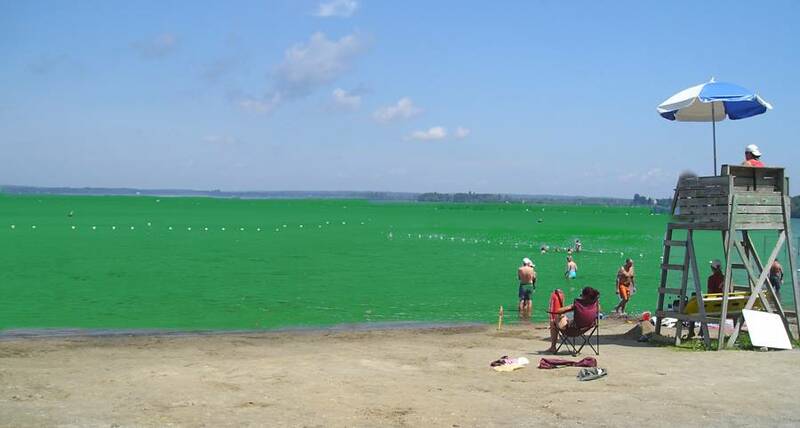 Brome Lake, the veritable jewel of Knowlton, had restrictions imposed and warnings against recreational use of the beach and water as blue-green algae reached dangerous levels and concerned Environment officials. This continues the unfortunate pattern of lakes in the area that have been shut down, often year after year, due to the toxic levels of the water becoming dangerous to humans. Waterloo Lake was closed July 12th and has closed every summer since 2003. Roxton Lake closed July 14th and has closed every year since 2003. Boivin Lake closed July 19th and 2006 is the first year the lake near Granby has been closed. Bromont Lake closed July 21 and was contaminated in 2005. Missisquoi Bay was closed July 25th and has closed every year since 2000. Selby Lake in Dunham closed July 26th and was contaminated in 2005. The Choiniere Reservoir in Yamaska Park was closed August 4th and was contaminated in 1990 and again 2003. July 17th Brome Lake was officially closed after first being contaminated in 2000. These harmfull bacteria can be caused by many factors and many residents feel that global warming and the increase of phosphorous in lakes due to the encroachment of humans and the waste and fertilizer they release into the lakes. Aquatic plants, fish and all animals near the lakes can be affected in negative ways by disrupting habitat and normal life functions. Liver function in humans can also be affected which is why contact with the waters of such lakes is to be avoided. This is not a new problem, the deterioration of septic fields, the fertilization of lawns and crops. As populations around lakes such as Lac Brome increase so does the need for public education regarding the concrete steps that can be taken to reduce the release of materials that contribute to such lake pollution. The Public Health officials of the Monteregie area ask people to not consume water from these lakes, to not eat fish from these lakes and to avoid letting pets play in the water. It was a wonderful summer in Knowlton at the public beach and while we feel that summer in the Eastern Townships is almost over it is still sad to see our lovely lake suffer from such a sickness especially when it is a result of our being here.